Aims. The latitudinal evolution of sunspot emergence over the course of the solar cycle, the so-called butterfly diagram, is a fundamental property of the solar dynamo. 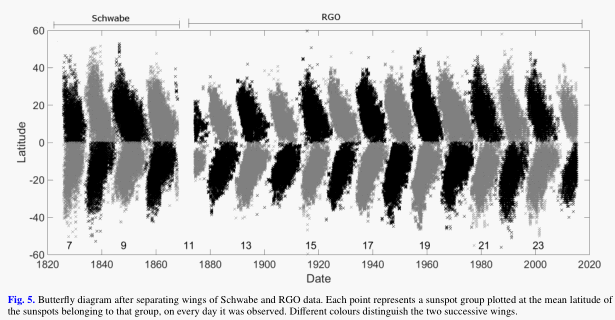 Here we present a study of the butterfly diagram of sunspot group occurrence for cycles 7–10 and 11–23 using data from a recently digitized sunspot drawings by Samuel Heinrich Schwabe in 1825–1867, and from RGO/USAF/NOAA(SOON) compilation of sunspot groups in 1874–2015. Methods. We developed a new, robust method of hemispheric wing separation based on an analysis of long gaps in sunspot group occurrence in different latitude bands. The method makes it possible to ascribe each sunspot group to a certain wing (solar cycle and hemisphere), and separate the old and new cycle during their overlap. This allows for an improved study of solar cycles compared to the common way of separating the cycles. Results. We separated each hemispheric wing of the butterfly diagram and analysed them with respect to the number of groups appearing in each wing, their lengths, hemispheric differences, and overlaps. Conclusions. The overlaps of successive wings were found to be systematically longer in the northern hemisphere for cycles 7–10, but in the southern hemisphere for cycles 16–22. The occurrence of sunspot groups depicts a systematic long-term variation between the two hemispheres. 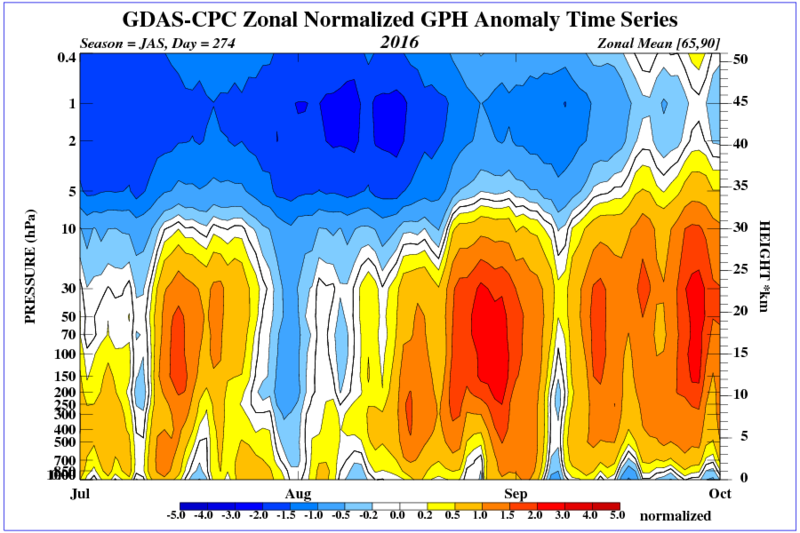 During Schwabe time, the hemispheric asymmetry was north-dominated during cycle 9 and south-dominated during cycle 10. Good find Tim. It’s very interesting that cycle 12 looks no stronger than cycle 14. The shape looks right for integration to temperature. I still think magnetics are the key, solar is asymmetric. Tallbloke situation in the north becomes interesting. In the stratosphere we have a strong anomaly pressure. A very strong ionization of the lower stratosphere. Jupiter reached perihelion on 5 May 1999. 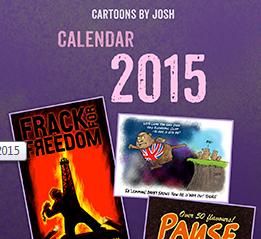 NB: NASA don’t mention the Jupiter perihelion. This is the pdf of the paper. That could be half the ~179 year Jose cycle.